Our Streets. Our Neighbourhoods. Our West End. See the news links below from Windsorite.ca and CBC Windsor regarding a City of Windsor proposal to replace Atkinson Pool with a splash pad. The Administration at the Windsor Essex Catholic District School Board is recommending an accommodation review for our Catholic schools in the west-end. I would like to hear your thoughts on the matter. 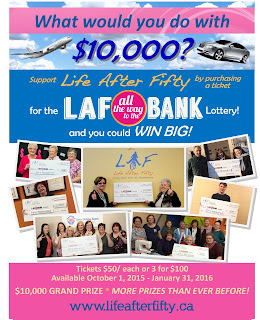 Please email me at fabiocostante@gmail.com or call me at 519-567-8719. See these two great initiatives below and help spread the word. 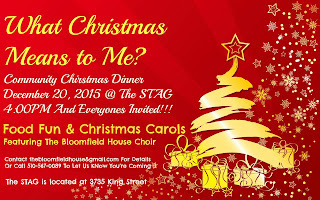 Would love to see you at the Holiday Party! There have been some unfortunate incidents in the Bridgeview neighbourhood as of late so the initiative below is timely and important. See an email being circulated by Tammy Murray with a corresponding flyer below. Thanks. Please circulate with your contacts. 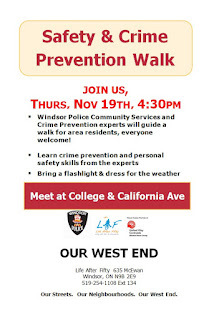 Join Windsor Police Service Crime Prevention experts, Community Services Branch and Our West End,to learn Personal Safety and Crime Prevention skills during our neighbourhood walk. Students of Excellence needs Volunteers!!! To Help Paint and Decorate the Students of Excellence Sandwich Towne Christmas Parade Float!! A West Windsor Initiative recognizing the hard work and academic accomplishments of West Windsor invites you to join the fun in recognizing our West Windsor Students!! When: Saturday November 7th noon -5pm And Saturday November 28th, 9am -5pm Corner of Watkins and Sandwich St. Help support the good character and achievements of kids from West Windsor schools: General Brock, Westgate, Marlborough and Westview Freedom Academy. The float will travel through the Santa Clause parade on November 28th and when it reaches the Media Stand, AM 800 will announce the names of those students who are recognized by their School Principals’ for outstanding performance! Contact Jessica Faught 226-246-8354. See two posts below by residents voicing their opinion on the ambassador bridge twin span and the flurry of activity surrounding this issue as of late. As I've always stated, it is very important that the opinion of residents who are directly affected by this issue be heard loud and clear. Thanks to Caroline and Jerry for sharing their views. It's hard to believe given this beautiful weather, but Christmas season is just around the corner. 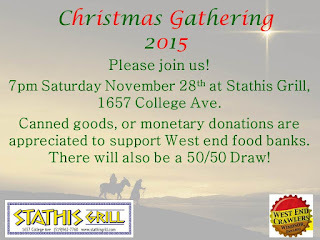 See this great event hosted by the West End Crawlers. Friends, see this great initiative by the Society of Saint Vincent de Paul below. Just a reminder about the Ward 2 Meeting and 20 Year Strategic Visioning event tomorrow evening at Mackenzie Hall. Please feel free to forward to your contacts. See this article by the Windsor Star. The City of Windsor was granted leave to appeal before the Supreme Court of Canada. I will be following this closely and will provide updates as this progress. In the meantime, see the link below. Hi Fabio! Our 1st Annual Pig Roast was a great success! The community sure came through, for The Bridgeview Community Outreach Program inc.! We'd like to invite the community to two of our upcoming events: our Halloween Party on October 25th and our Christmas Dinner on December 6th. Both events need to have kids registered early, in order to have a chance to win prizes, get candy, and presents. It's much appreciated if you could post these up! THANK YOU! Please spread the word and help clean up our streets! This is a great community initiative! Amazing team work for neighbourhood renewal in West Windsor, Thank you all for a great West Mesh community celebration on Sat Sept 19th ! Special Thanks to University Avenue Medical Centre for the sponsor of our Community Tent, in particular developers Van Niforos, the Penalty Box Restaurant, Dr. Jay Rampure and George Sofos. Thank you to our friends from Ford City, Karlene Nielsen and TJ Auer for all of their amazing help!! Coastline Band you were amazing, a community celebration wouldn't be the same without good music!! Thanks to Our West End volunteers and Roundtable members, The Bridgeview Community Outreach Group, Bloomfield House and Bloomfield House Choir for our community entertainment, Cardinal Place for assistance/equipment and all of our participating community partners, organizations and businesses. 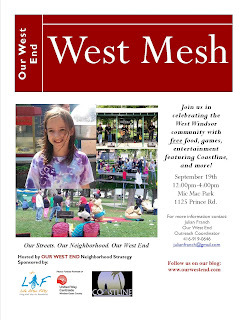 The team at Our West End is excited to announce the 2nd Annual West Mesh celebration! See the flyer below for more details. See you there! Please see an email I received from the residents of Askin Blvd. Don't forget to save this date--Monday September 7, 2015--for the Annual Askin Boulevard Block Party. 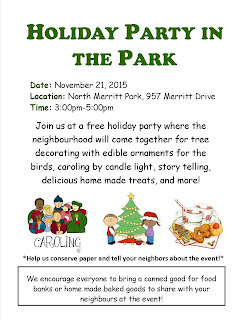 Join us to celebrate our neighbourhood and our friendship. Starting at 5 p.m. in the 400 block of Askin on the boulevard. Bring something to eat and drink and your favourite chair. Don't forget a dish to share. Great news. A new grocery store opened on Crawford just south of Wyandotte, where the old Price Choppers was located. Some more excellent news for the west-end. It was recently announced that the former Grace site on University Avenue will become the future Urgent Care Centre under the Mega Hospital Plan. Between this announcement, the new medical centre announcement (see previous post), penalty box opening and some University of Windsor campuses moving downtown, it looks like University Avenue will shortly be a booming and bustling street! 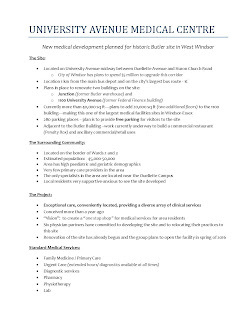 This is all great news for the west-end and could be the catalyst of many more positive developments. We should all be very happy and hopeful with this great news. Here are some links featuring the plans. 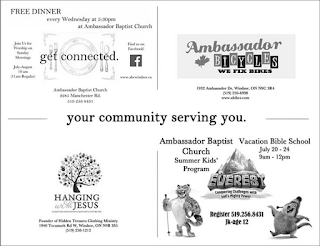 Please see below for some upcoming community events. There is some amazing news that you may already know. On Tuesday, there was an announcement that a new Medical Centre will be locating on University Avenue just west of Crawford. Below are some news links along with the press conference. It is expected to come to fruition in spring of 2016. 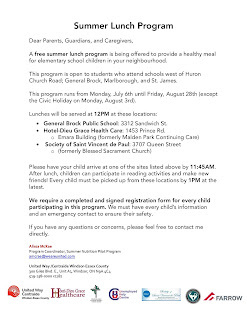 Please see info below regarding the summer lunch program I mentioned in an earlier blog post. Thanks. Please see an email from United Way looking for volunteers. Please spread the word as this is a great cause for our community. Please see an email from City Councilor John Elliott of the sandwich Teen Action Group (STAG) below. 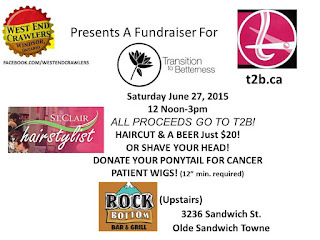 Also, kudos to Rita Higgins from West End Crawlers who shaved her head for donations to Transition to Betterness. 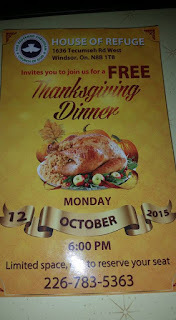 The flyer is also below. Due to the rain the STAG will be hosting a yard sale on Sunday June 28, 2015in the hallways inside the facility. A hotdog lunch will also be available to purchase. Please come out and support it. Please see an email (and attached poster) I received from Tammy Murray and please contact her (info below) if you have any questions or would like to learn more about this initiative. 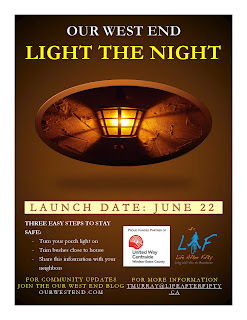 Join in our Light the Night project across West Windsor. 2)Neighbours talking to Neighbours, -encourage each other toturn porch lights on, every night. -Through our Crime Prevention Town Hall with Windsor Police Services last March 31st, 2015 we learned that theregular use of porch lights deters crime and improves safety in our neighbourhoods. When: Start date Monday June 22nd, before you leave for the fireworks…. Turn your porch lights on, and ask a neighbour to do the same. 3)Keep it going; Make a habit of turning porch lights on! 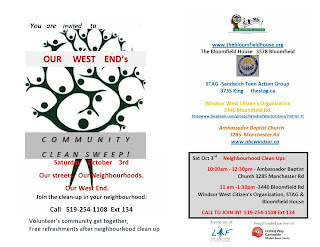 -keep Our West End neighbourhoods shining with light! Below are some upcoming events that may interest you. Please share and spread the word. 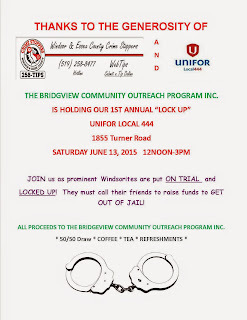 The Bridgeview Outreach for Youth Group is hosting a 'Bail or Jail' fundraiser at Unifor 444 local hall at 1855 Turner Rd. 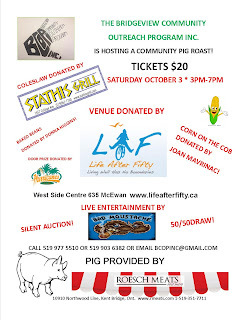 Come see local politicians and leaders get put in jail and help bail them out, all for a great cause! 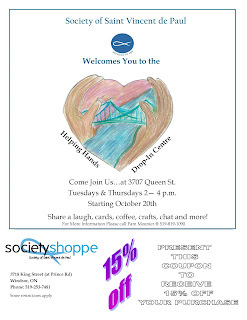 The fundraiser will be held on Saturday, June 13, from 12pm to 3pm. The Sandwich Town Farmers Market has reopened several weeks ago. Go check it out any given weekend at the corner of Mill and Sandwich, tucked in behind Sandwich Street on the east side of Mill. From that point forward, so much has been accomplished, thanks to the fantastic partnership and support of neighbourhood residents, the United Way, Life After Fifty and the tireless volunteers and staff people that have dedicated their precious time to making the west-end a better place. I am delighted to say that our neighbourhood strategy is nearly complete. It took longer than the anticipated 12 to 18 months that I originally called for, but that is because there were some unforeseen obstacles and, I might add, opportunities, along the way, as there generally are with endeavours of this magnitude. 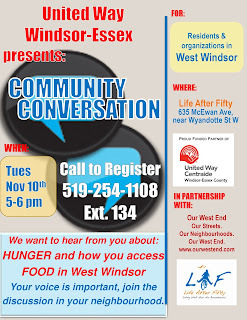 We are proud and grateful to officially announce that Our West End through Life After Fifty has received an additional 5 years of support from the United Way Windsor-Essex. As a consequence, Our West End is hiring another part-time Outreach Coordinator to help implement our goals and findings from our neighbourhood strategy. If you've driven by Aaron's Furniture on Tecumseh Rd. W. this weekend, you may have spotted a beautiful mural alongside its wall. Thanks to the effort and tireless work of Windsor Police, Westview Freedom Academy, Our West End and United Way / Life After Fifty, what was once a blank canvass is now a head turner and another positive beautification project in our west-end community. A further thanks goes out to Seguin's Hardward, Gray's Home Hardware, Canadian Tire and Merlo's Paint for providing paint and other supplies. A true community effort! The project will be complete in a few weeks, but here are some pictures from the event along with local media coverage. Please see an email I received from Tammy Murray, Our West End Outreach Coordinator, and United Way who's conducting the survey. Can you please add this to the next blog post United Way is encouraging anyone to take the Food Security survey to gather data for future programs. They want to know where anyone gets their food from and their perceptions about how accessible food is financially, and proximity wise. Here is the electronic survey monkey link which contains the food security survey. 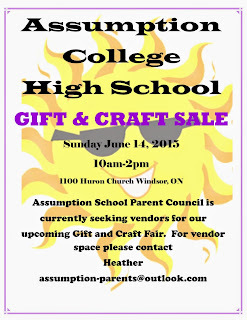 Assumption Parent Council is hosting a craft and gift show on Sunday, June 14. They are currently looking for vendors and would like to offer the opportunity to our own community first. 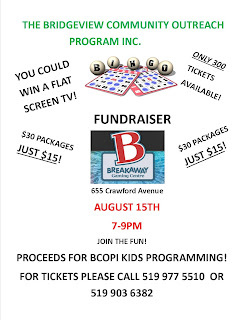 If you have a home based business and would be interested in participating, please contact Heather McAuley at 519-919-9422 or by email at assumption-parents@outlook.com. Vendor spaces are available on a first come first served basis and members of our community will be given priority until May 20th. Friends, if you have some time this upcoming Sunday to help clean up a park, check out the info below and get in touch with ERCA. Volunteers are advised to wear long-sleeved shirts/pants, and boots are recommended. Meet at the corner of Cherry Blossom and Ironwood. Parking is available along those roads. A light lunch and refreshments will be available for volunteers. You may have already read that the $10 million proposal for Assumption Church has fell through. This is very disappointing news. "This transcends religion. You don’t have to be Catholic. You don’t even have to be Christian. And it’s about more than saving a building. This is about preserving one of the foundations of this community...The history of Assumption can be traced all the way back to the founding of Detroit in 1701, when Cadillac invited aboriginal people to live near the fort. They responded, asking for a mission – what became The Mission of Our Lady of the Assumption.